What we say and what our customers hear can have two totally different meanings. Be aware that many phrases that are used daily might need to be considered as to whether or not what's being said is leaving the best impression. Here is an example—the customer is paying for their purchase and says to the person handling the check out, "thank you." Sadly, 9 times out of 10 the person checking them out will say, "you're welcome" and leave it at that. Isn't this backwards? The customer is thanking the seller?! This is such a pivotal moment in leaving the best, last impression. Although, "you're welcome", is a nice phrase, if the customer does not receive a sincere, "thank you", the "you're welcome" feels like and sounds like, "NEXT." 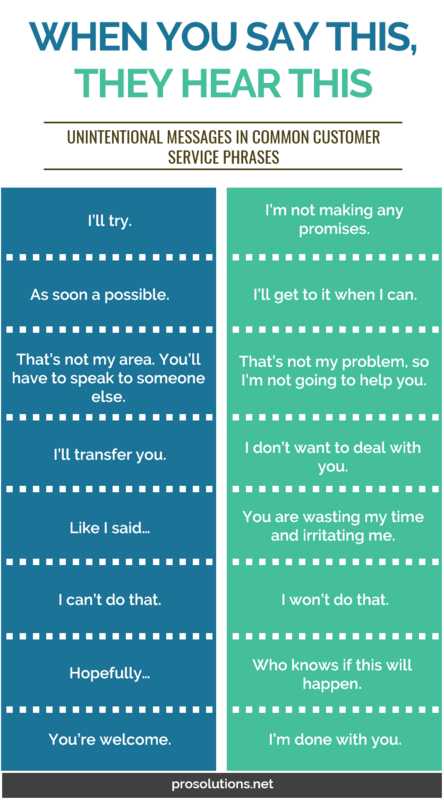 When considering how all team members represent your business by what they say and how they say it, these statements below offer some reflection on what not to say. Strike a chord with you? We hope it did. Now share this and train on these examples so these mistakes don't continue to happen. Click here to download the above infographic. Be masters of your customer service!